Contributing to Solar Spectrum's contemporary, open office design, Rockfon innovative stone wool ceiling products help enrich this modern workplace with a good acoustic experience that promotes natural solutions, sustainability, peace of mind and quality of life. Prominently situated on the fourth floor of City Center Square in downtown Kansas City, Missouri, Solar Spectrum's office supports the company's continued growth in distributing solar panel systems to customers across the U.S. The company designs residential and commercial power systems, provides financing options; and manages system installation, maintenance and performance. Living the brand, Solar Spectrum's modern, open office design reflects a positive culture of openness, interaction and energy. Harnessing the natural power of stone, Rockfon acoustic stone wool ceiling systems are positioned strategically throughout the workspace to enhance visual interest, sustainable practices, employee comfort and productivity. The 38-year-old building is a cast-in-place concrete tower originally designed by Skidmore, Ownings & Merrill (SOM). Hoefer Wysocki Architecture designed Solar Spectrum's new offices. James Evrard, associate at Hoefer Wysocki and project architect, says, "In the early '90s, the previous tenant built out the space very simply with tight enclosed offices along the exterior wall and gypsum ceilings. Opening up the space was a lot of fun. Returning to the concrete waffle slabs first imagined by SOM is the stuff of architectural dreams." Polished gray concrete floors complement the exposed concrete and convey a sense of functional industriousness and contemporary style. The firm describes the space as "composed around an open central hub that overlooks the adjacent four-story atrium. This central hub links social areas and meeting spaces in an open and interactive environment, and provides easy access to work areas." Yellow and orange accent white walls, exposed steel pipes, cubicle framing and enclosed, metal-clad meeting rooms. "As we opened up the space, we also were taking away everything that absorbs sound and showcasing all the reflective surfaces. We needed something more than carpet to manage the acoustics," says Evrard. "We knew of various standard acoustic ceiling clouds, but weren't satisfied in what we were finding. Then, we came across Rockfon. From our research, Rockfon acoustic islands were the best thing going to meet the acoustic design and the aesthetics, and they included recycled content." Evrard and Stephani Chaffin, an interior designer with Hoefer Wysocki, contacted Rockfon as they were working on Solar Spectrum's final steps in the office fit-out. 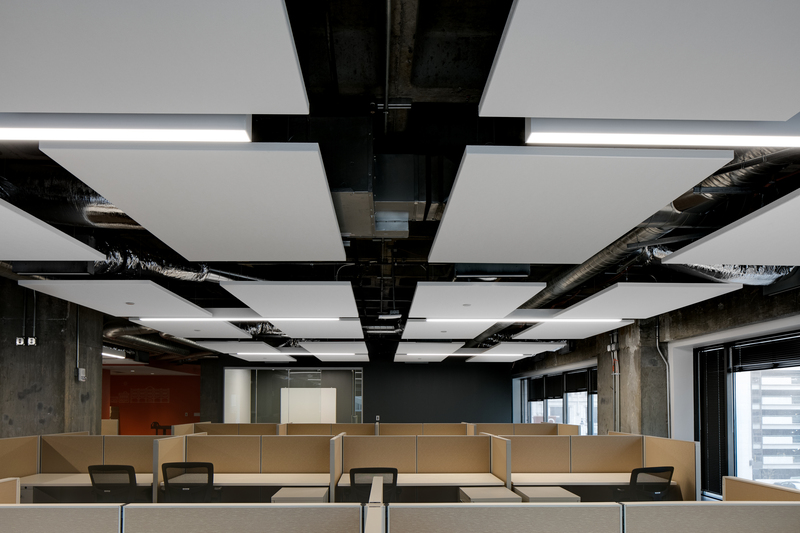 "They said they were under 'a super short deadline' and asked for our assistance with a lay-out for the free-hanging, sound-absorptive, frameless ceiling islands that would strategically optimize acoustics for the open office environment," remembers Gary Madaras, PhD, ASA, INCE, Assoc. AIA, who serves as an acoustics specialist at Rockfon and leads its Optimized Acoustics initiative. "We had a lot of calls with Gary," acknowledges Evrard. "During Phase 1, it was all hands on deck and go-go-go. We had about 12 weeks from getting the permits to getting Solar Spectrum's people in their new space. In Phase 2, we had a little more time – about 16 weeks – to explore existing conditions, apply the lessons learned in Phase 1 and make sure we had everyone on board." 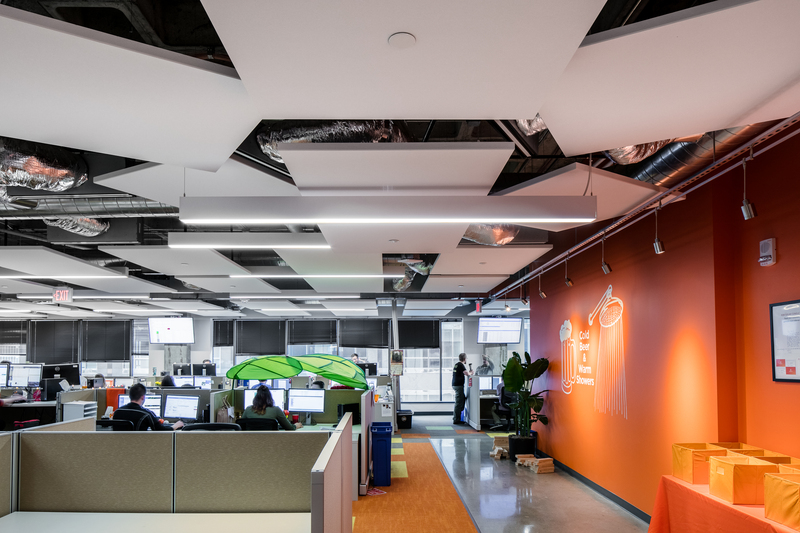 Led by Madaras, the acoustics specialists at Rockfon went to work on Solar Spectrum's Kansas City office after receiving the reflected ceiling plan and furniture plan. "Open office environments usually strive to promote collaboration," observes Madaras. "However, the potential distraction of escalating and echoing noise may unintentionally cause the opposite result where workers prefer the isolation of personal headphones, or retreat to the few closed-door spaces offering privacy and concentration. It can be a complicated balance." Madaras continues, "I remember a conversation with Hoefer Wysocki's project architect James Evrard and the owner's representative. They wanted to ensure that the open office areas would not be too quiet. It was important to them that the young salespeople feed off an energetic atmosphere. The acoustics could not be too dead or dampen the collective sales synergy. This added yet another pretty significant design challenge. The solution had to fall in between too loud and too quiet. With all of these parameters, Rockfon had to work smart and fast to identify a solution that was just right." The approved solution selected by Hoefer Wysocki and Solar Spectrum uses a combination of more traditional, rectilinear island array layouts along the sides of the triangular floor plan and a more free-form, yet organized, layout of the islands elsewhere. Madaras elaborates, "A typical array of square or rectangular acoustic islands inside a triangle would either result in awkward breakups of the arrays or the need to cut the islands, which would lengthen the installation process and waste materials. Since the project also had a tight construction schedule, the solution would have to utilize standard shapes and sizes." For the free-form island layouts, Rockfon proposed a "sun pod" arrangement with a square island at the center encircled by additional islands. "Seeming to radiate out from the center, these additional islands are suspended with a slight overlap on staggered, horizontal planes," Madaras explains. "The design is carried into other areas of the project, such as in the multi-purpose room and kitchen/break room." A more traditional, rectilinear layout of the Rockfon Islands was used in other parts of the floor plan. As the ductwork, lights and fire suppression systems were already in place, the Rockfon team needed to accommodate these systems. In key places, sprinkler heads were recessed into the islands and the covers blended into the white surface. "It's a clean, good-looking modern product," says Clayton Norvell, associate superintendent at general contractor Centric Projects. "I've heard nothing but good things from the project about the way it looks and functions." Jim Frasca, Rockfon district sales manager, agrees, "The design team selected our stone wool ceiling products for their smooth appearance, their modular sizes, and their fit within the project's budget and timeline. But most importantly, it is the high acoustic performance of our products that led the team to choose Rockfon to meet the project's requirements." Evrard adds, "During construction, you would notice as soon as the Rockfon Islands were installed. It made such a difference in how loud the space was." In addition to acoustic comfort, Rockfon stone wool ceiling panels and islands deliver a number of other notable performance benefits including fire protection, water and humidity resistance, and UL® Environment's GREENGUARD Gold Certification for low-emitting products. Rockfon's stone wool panels and metal suspension systems have no nutritional value for harmful organisms such as mold or bacteria, which helps maintain cleaner, healthier indoor air. Wellness, sustainability and energy considerations are a priority given Solar Spectrum's business focus. The solar energy generated by an average 6 kW Solar Spectrum Energy System during 20 years of use is estimated to offset about 118 metric tons of CO2. Within its Kansas City office, the smooth, white surface of Rockfon panels and islands reflects 86 percent of the light from the exterior windows into the office interior. Maximizing natural light minimizes the need for electric lighting and, in turn, can reduce overall energy use and associated costs. Further contributing to Solar Spectrum's environmental goals, Rockfon stone wool ceiling panels consist of up to 42 percent recycled content. The rest is made primarily of basalt rock – a material in essentially limitless supply. Complementing the stone wool panels, Rockfon Chicago Metallic® suspension systems also contain up to 90 percent recycled content and are 100 percent recyclable at the end of their useful lifecycle. In total, Sierra Building Products supplied Wilko Construction with 13,100 square feet Rockfon® Islands™, plus 2,000 square feet Rockfon Alaska® acoustic stone wool ceiling panels. As with all of Rockfon stone wool ceiling panels, these panels also are 50 to 75 percent lighter than other ceiling panels for easier installation. Wilko's foreman Kenny Sikes, along with one apprentice, installed the entire system for both phases of Solar Spectrum's build out. In Sikes' words, "Hanging it was no problem at all and went fairly fast. The templates Rockfon provided were simple and easy to use. I've been hanging ceilings for more than 30 years and thought it was great. I have no complaints." The modular sizes assist in making installation as stress-free and as fast as possible. The 2-by-2-foot Alaska panels used in the second level enclosed offices and hallway easily installed within Chicago Metallic® 1200 15/16-inch exposed ceiling suspension system. The islands for the open office and common areas were provided in 4-by-4 and 4-by-6 feet sizes and hang from the structural concrete above them. "It was a very quick product install. The islands took some minor adjustments to get just right," notes Norvell. "The crew was able to do an entire ceiling in just a few weeks." "The client was very pleased with the way Rockfon ceilings look, perform and fit their workspace," Frasca says proudly.